I certainly cannot! The Wisteria Tale continues. I stepped out on the deck that afternoon, it was such a nice day. Low and behold, the wisteria had decided to create such a lovely display. Do you suppose she heard me talking about chopping her down? Crazy how she hasn’t created the display I’ve dreamed of – UNTIL NOW. Kind of how my hair misbehaves – until the day before I plan to chop it all off. I really hate to say this too loud, but my plan to cut her down to size remains unchanged. Only perhaps I’ll wait a week or so until those blooms fall. So that was the wisteria just 3 weeks ago. You can certainly understand why she really needs to go. But wait – what have we here – right in the middle of the railing? I really cannot believe this. The wisteria lives to see another summer. Nice try, wisteria, but I see serious trimming in the future. My wisteria vine was doing such a fine job. I was getting to know her so well. After years of waiting for her to bloom, I did a little reading and realized I had never pruned her. The year after I pruned her, she bloomed. Just a few, but they were gorgeous! The following year, I was ready for a banister full of blooms, until a late frost took care of all the promising buds. I got her to climb the railing of the steps that lead from our yard to our deck. She did well as our “privacy keeper”, as our yard is ever so close to the neighbor’s. She has tried to provide housing for a few of my fine feathered friends – but it’s all about location, location, location. 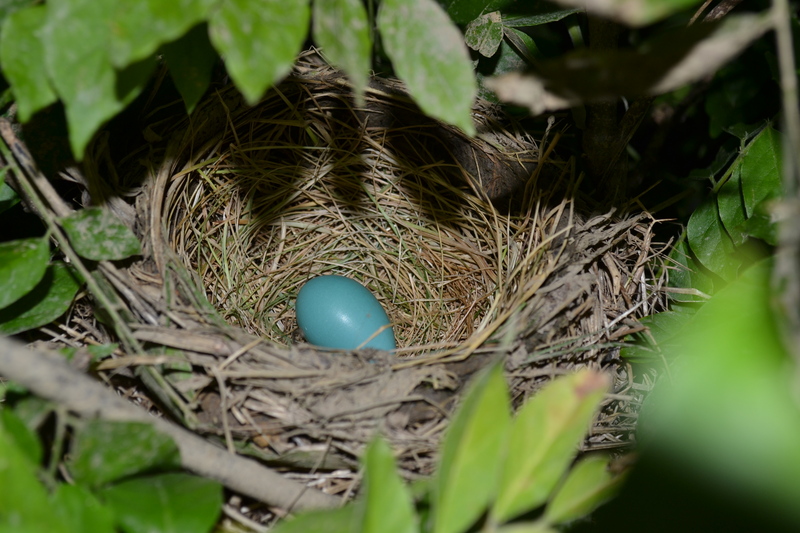 The leaves and branches appeared to provide protection, but the nest was much too close to the steps and the eggs made a convenient snack for some lucky predator. Last summer, we decided to finally attach the pool to the main deck with a pool deck, and having a deck on the pool is great. Traipsing through the yard to climb up the ladder, then climb down the ladder into the pool was getting a bit daunting. And I could never figure out how to clean the pool without actually getting in, which wasn’t such a bad thing. Until closing time. We usually wait until mid September (ie temps in the low 70s or upper 60s) to formally close her down. Bit chilly in there! Now with the new deck, I’ll be able to clean without necessarily getting wet! I’ve never been good about “before” pictures. However, I did find a couple of shots of the garden areas around the deck that I took back in 2009. If you look closely, you can see the wisteria climbing up the railing in these shots. The construction of the new deck meant new footers had to be poured. And one of those footers meant the wisteria had to be trimmed – severely. The workers must have thought I was crazy, I was more worried about the shape they were going to leave the wisteria in than I was about the outcome of the deck project! One nice thing about the wisteria, she’s very forgiving. Here’s a look at her today – after all she’s been through, she’s looking pretty healthy. And I promise to get some great pictures once she blooms again! On my way to the car this morning, I strolled past the robin’s nest in my wisteria that now holds 4 eggs!! At least it held 4 eggs yesterday. Last night while lying in bed, I thought of the nest. Thought I should take a picture of the 4 eggs, just in case they hatched soon and I would miss my chance to record them as eggs. But it was late, too dark for good pictures, it will wait for tomorrow. And now the eggs are gone. The nest was EMPTY when I went out this morning. I am so sad about this. I was looking forward to watching the birds hatch and grow. But I guess my railing was just too exposed, and those bright blue eggs must have been a tasty treat for some unknown predator. I have no idea what creature would have done this, but our neighborhood has its fair share of large black crows that I’m very suspicious of. There was no evidence of what visited the bird family, no pawprints on the steps, not even a speck of shell left behind. Just the nest. I glanced over at the fence and spotted momma. She was just watching me look at the nest. Not sure if birds have emotions, but I imagine she’s pretty sad too. This weekend was filled with all sorts of outside activities – watching Son #2 playing baseball, watching B playing softball, swimming in the pool (I am so glad we opened it in late April), and building a gazebo. And I realized that we humans weren’t the only ones so busy. My wisteria has become the home of a bird family! We noticed last week that a nest was being built, but I really thought it was too close to our steps that we use every day to get from the deck to the backyard. We went out on Sunday, removed the nest, and look what I found yesterday morning! Those robins are very persistent. Now you must understand, this wisteria is growing up the railing of my deck, which connects the deck to the yard below. Not the most desolate location for a nest. We will do our best to give this family some privacy, and hopefully the momma bird will be patient with us for using our steps. What’s really cool about this location is how close we can get to it. Other nests have been built under the supports of the deck, but we can’t really see what’s going on in there unless we look through the boards of the deck. Not a very clear view. But we will have a close up view of this family. I’ll keep you posted on our new borders! Lost in thought on my way to town this morning. Most mornings, I get in the car, say my morning prayers, and flip on the radio to quiet the drone that are my racing thoughts. Some mornings I don’t flip on the radio and actually listen to the thoughts. I keep a notebook in the car for these mornings, because the thoughts are really worth noting and I’ll forget them all by the time I enter the parking garage. Notes from this morning included “wisteria”, “trumpet vine”, “english ivy”, “evening primrose”. One evening last week, I coerced my daughter to join me at the middle school for the annual Greenfest. One of the new events at Greenfest was a perennial exchange. I was so excited – I went straight home from work, dug up two of my favorite perennial specimens, and lugged them off to the Greenfest. B does not share my enthusiasm for gardening, which really saddens my heart. But she was equally excited about the food displays. At the perennial table, I traded my stemless evening primrose (oenothera triloba) for a fern. This is one flower I can hardly wait for each summer, as the kids love watching the buds bloom each evening. Just at dusk, they race outside, trying to guess how many flowers will bloom tonight. And if they are lucky, they get there just in time for the show. You can actually watch them open! 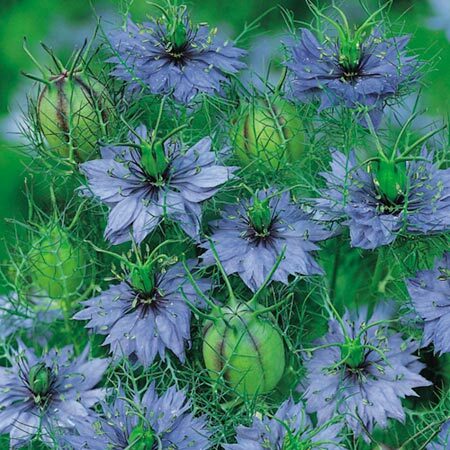 And I donated my Love-in-a-Mist (nigela damascena), which is actually an annual, but it self-sows, so I made it work. They will probably not like it after a couple of years when they can’t figure out how in the world it shows up everywhere – even in the cracks of the walkway! But it’s such a pretty blue flower, I forgive it for its aggressive nature and pull the ones that just don’t belong. Back to my list – my list of aggressive plants that I have tried despite the voice of experience. When I first bought my wisteria and shared the news with Alice (my favorite gardening friend), her reaction was “oh my”. What? Well, just make sure it has some good support. It can bring down a small house. Of course, I’m training it up the stairs of my deck, along the rail. Hopefully, the rails are strong enough to hold it. I’ve also been told of how difficult it is to grow wisteria in my part of the world. Maybe that’s another reason for Alice’s concern. I know I came close to enjoying the plant in bloom this year, but the weather just did not cooperate. Trumpet creeper (Campsis radicans) – the first time I saw it was at the beach house in North Carolina. I’ve told my English Ivy story, and Alice actually warned me about that one too. 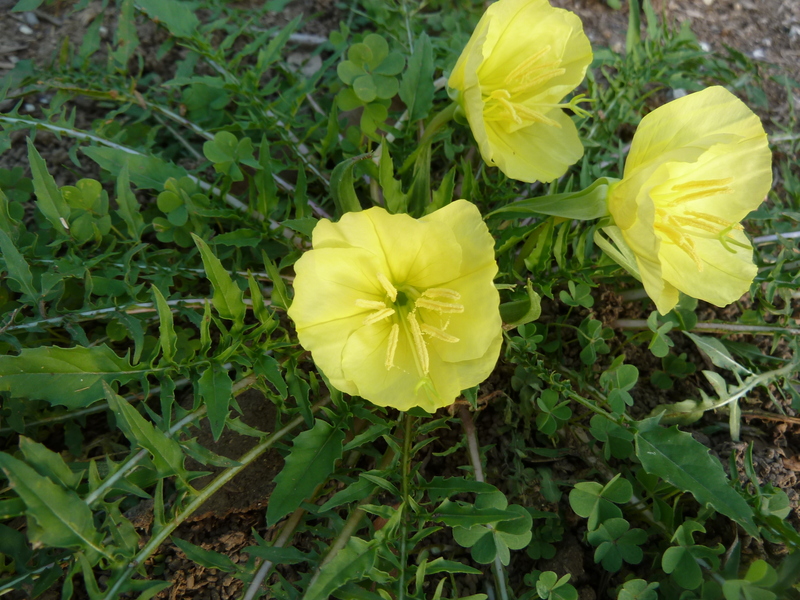 She gave me my first sample of evening primrose (not the stemless variety) and told me I’d have to keep it at bay, as it could take over the entire garden. She was right on all counts. I really have to applaud the new principal at our middle school. He is really encouraging the students to be good stewards to the environment. He spearheaded this Greenfest a few years ago, and the program continues to grow each year. He brings in local nurseries, a bee keeper, an etymologist, a Penn State Master Gardener, and has demonstrations that each class puts together – similar to a science fair. The perennials that were donated will be planted in the courtyard (which for 25 years has had nothing but grass growing in it). Lamenting the wisteria . . . . So the azalea, rhododendron, and hostas all survived the Freeze warnings we have had for the past couple of weeks. I walked out on the deck yesterday, and to my horror, the wisteria that I’ve been waiting for 10 years to bloom got bit by the frost. I cannot believe I did not think to cover this vine; it has been trained up the railing of my deck and was going to look spectacular this spring. I have had this wisteria for a good 10 years, and for the first 8 I could not figure out why it wouldn’t bloom. I knew it would take a few years, as I bought it as a very young plant. I patiently trained it up the two story flight of stairs to the deck. 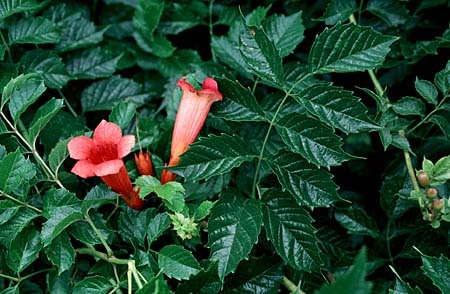 I googled it, only to discover that you need to prune it to encourage blooms. So two falls ago, I pruned it for the first time. Last summer, we had about 4 sprays of blooms, and I was so very excited! This past fall I pruned it very aggressively, and with our early spring, it was holding hundreds of possible blooms. I took Son#2 out to show him the blooms, and to plead with him not to pick them off. They were the sort of tempting vegetation he loves to destroy, and I wanted to make sure he knew that it wasn’t to be messed with. He understood. But I forgot my dear wisteria. As I went out to the deck yesterday, I discovered the hundreds of blooms are dead. The hostas in the backyard are protected and I never even stepped into the back to cover things. They were going to survive. But my wisteria won’t be blooming again this year. I must be patient and wait yet another year.